Deadweight loss is the inefficiency caused by, for example, a tax or monopoly pricing. 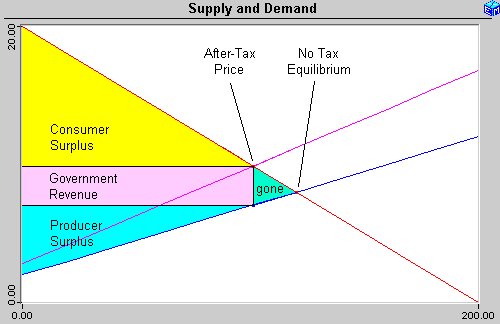 The diagram below shows a deadweight loss (labeled "gone") caused by a sales tax. By causing a difference between the pre-tax price received by producers and the after-tax price paid by consumers, the government secures the area labeled Government Revenue. This revenue comes at the expense of the consumer surplus and producer surplus that would have existed in the no tax equilibrium. The "gone" triangle of deadweight loss goes to no one because those transactions are prevented by the sales tax. This diagram is borrowed from Who Pays a Sales Tax?, which applies this concept.